Vacation Bible School. It’s not exactly a vacation. It doesn’t happen at school. And hopefully the Bible’s involved in there somewhere. About two-thirds of churches host a VBS every summer, but it’s always a daunting task to plan and execute. Know your audience. And remember that children aren’t your real audience. Sure, they’ll be the ones attending VBS. But they aren’t the ones driving the kids there or putting it on the calendar. That would be parents. They’re the ones you have to convince and remind to bring their kids. You can even work on getting parents involved in helping with VBS. The more they’re involved, the more they’ll appreciate how much hard work it takes to pull off. Summer should be a time to relax, but it somehow seems busier than ever. Parents have to take their kids to seemingly endless summer camps, sports events, theme parks, and birthday parties. Do your church families a favor by letting them know VBS dates well in advance. The beginning of the year would be ideal. Getting on the calendar early means that parents will plan the rest of their summer around VBS. Vacation Bible School is an opportunity to reach people who don’t know Jesus. Christians are not the only ones who get off of school for the summer, and all of those kids have to find somewhere to go. You can start to build trust with local families by helping take care of their kids a few hours a day. 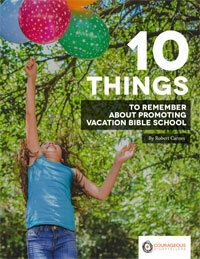 Download 10 Tips for VBS for your church now. Church communication is hard. We can help. Our Courageous Storytellers membership site offers resources just like this. Every month we add fresh content focused on a specific theme, so our library of tips, tricks, and tools gets better all the time.